It is my great pleasure to be apart of the Blogger Book Fair. As we kick off the week long celebration I get the joy to introduce to you a great author. For this first day I have with me Jacquie Rogers. Dawn: Jacquie, it is great to have you with me today. First tell us a little about yourself. Your likes and dislikes, your favorite foods, your special pets? What makes you…you? Jacquie: Thanks, Dawn! It’s great to be a guest on your blog and participate in the Blogger Book Fair. Likes: the smell of sagebrush, wind rustling through the junipers, baseball, rodeo, and hitting the bulls-eye. I love reading an action-packed novel that makes me laugh and sigh. Dislikes: Macaroni and cheese, cleaning house, and over-bearing people. Pets: we have one cat named Annie who was feral when we got her thirteen years ago, and only now will let us pick her up and pet her. But she’s a sweetheart, even if she’s a little scaredy. (http://www.jacquierogers.com/hoo.html) is set. 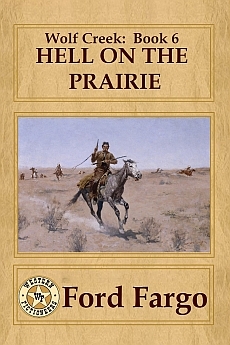 It seemed a natural thing since that area isn’t far removed in culture and deed from the wild west, and I use some of my experiences in my fiction. Jacquie: My latest release is a traditional western short story, Muleskinners: Judge Not, in the Wolf Creek, Book 6: Hell On The Prairie anthology. Before that, I released another short story, a time travel to the future romance, titled Single Girls Can’t Jump. 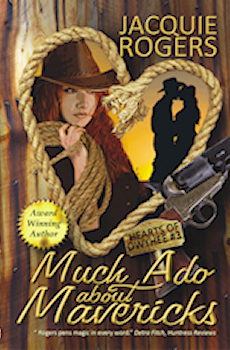 But my latest novel is the third book in the Hearts of Owyhee series, Much Ado About Mavericks. Ben Lawrence could hardly wait to see his mother and sister, even if his stomach soured every time he thought about his childhood home. But he had to take care of the family and ranch now that his father had died. Worse, he had to contend with Jake O’Keefe because Pa thought his own son too incompetent to hire good people, even after four years at Harvard and nine years of practicing law. The soda was refreshing and he took his time while she waited, not patiently, shifting her weight from left to right, then tossing a few pebbles. She nearly laughed at his horrified expression. He set his lips firm like he was cogitating. She didn’t know what there was to think about—she’d laid out the deal square enough. “Got a woman?” Jake could’ve slapped her own fool face. Why the hell would she care? But that tickly feeling deep inside seemed to make her lose all her brains. “And found—ain’t interested in eating my own cooking.” She’d starve to death if she did. Whip had taught her how to rope, shoot, and just about everything else, but he never could teach her how to cook. Every concoction she had tried ended up looking and smelling like fresh-branded cowhide. Not that she’d wanted to learn in the first damned place. But it would be a helluva long six months if she buzzed like her guts were filled with bumblebees every time Ben Lawrence took a gander at her. Dawn: Awesome excerpt. How long did have you been writing and when did you know that writing was what you wanted to do? What kind of writer are you, a plotter or a pantser? 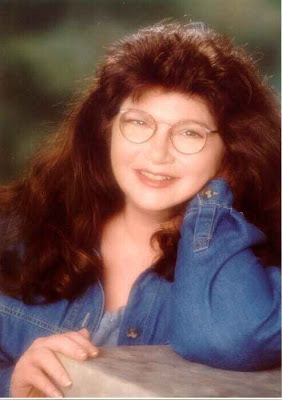 Jacquie: My mother wanted me to be a writer so of course I did everything I could think of except write, and only started about 15 years ago. So I’m not one of those who say they were born with pencils in their hands. As for how I go about creating a story, it all starts with characters and I don’t write a single word until I understand my characters as well as myself. Then I plot out the bones of the story, write out a few scene ideas along the way—but then it’s all seat-of-the pants. So 50/50. Jacquie: I’m on Facebook more than the others, but it’s frustrating because I’m at my friends limit, so I’ll include the link to my author page. Jacquie: That’s a hard one because I’d like to go everywhere, just about any time—it’s all fascinating to me. I’d love to visit Ancient Greece and before that, Ancient Babylonia. But since I write Westerns, the first place I’d like to visit would be Silver City, Idaho Territory, in the early 1880s. Some things just can’t be learned from books—daily life of those who were never written about, for instance. It would be interesting to follow a rancher’s wife around all day (if I had the stamina! ), and the rancher, too. I’d love to go on a wild horse roundup. Then there’s town life. The general store’s contents would tell me a lot, and who wouldn’t want to be a fly on the wall in a saloon or brothel? Jacquie: For the Westerns, it would be the fiercely independent spirit and can-do attitude that I so admire. The lawlessness and resulting moral code interests me. Rooster Cogburn might not have been a model citizen, but he never waivered from his personal moral code. For my Fantasy stories (Faery Special Romances and others), I’m drawn by the magic. Life is magic but we mostly ignore it, so in fiction we can magnify it and even glorify it. Besides, I’d love to clean my house with a twitch of my nose like Samantha Stevens in Bewitched! Jacquie: I have never read by author and in fact, I’m pathetically name-challenged, so rarely ever remember the titles or authors of the books I’ve read. That said, there are a few that stick in my mind, the first being Mary Renault and her novels set in Ancient Greece. Great books, all, my favorite being The King Must Die. Western authors: Louis L’Amour is the king, of course. Currently, I’m reading books by Troy D. Smith and James Reasoner, and am also drawn to books by Robert Randisi and others. For a list of who’s who in western fiction, go to the Western Fictioneers site (http://www.westernfictioneers.com) and click on Members. In Romance, there’s Leigh Greenwood, Maggie Osbourne, Kathleen Eagle, Gerri Russell, Gina Robinson, Heather Hiestand, and in Mystery, there’s Ann Charles and Wendy Delaney (new author). A slew more. But like I said, I don’t choose books by author or title. I read the blurb, click on Look Inside, and whatever interests me, I buy. Jacquie: Usually, I listen to four little boys fight. Peace and quiet would sure be nice. Jacquie: Night owl. I write from 10pm to 5am, and go to bed around 6am. Jacquie: Besides the Blogger Book Fair, I’m in the Western Roundup Giveaway Hop. 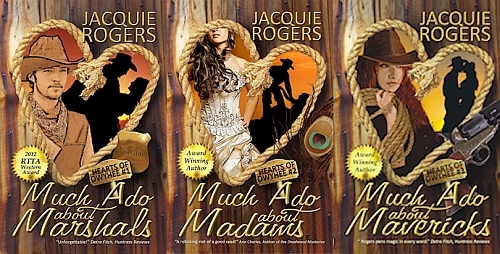 I’m giving away several books and you can find out more at Romancing The West: http://romancingthewest.blogspot.com. Jacquie Rogers, thank you for being with me today. I enjoyed learning about your book and look forward to reading it. and come back to see me tomorrow to meet my guest Zrink Jelic. You're Welcome Jacquie. I can't wait to read your books. They are now in my TBR pile.